They will always be young at heart but the fact is that this year they are celebrating half a century! 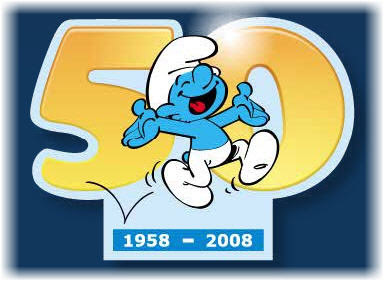 Yes, the smurfs are planning to celebrate their 50th birthday this year with a new TV series, books and a film, with UNICEF among the beneficiaries, their human promoters said Monday. Europeans were only introduced to them in October 1958, when Brussels-born cartoonist Peyo (Pierre Culliford) first launched the "Schtroumpfs" onto an unsuspecting Belgian public. Throughout 2008, 20 European cities will be flooded by the minute characters. "The invasion will begin on January 20 and end in October," said Hendrick Coysman, head of the Belgian-based IMPS group which holds the rights to the cartoon characters and is controlled by Peyo's widow Nine and children Veronique and Thierry Culliford. The sale of tens of thousands of small figurines will benefit the United Nations Children's Fund, Coysman said. A much larger Smurf statue, decorated by an unnamed celebrity, will be auctioned off on October 23, the 50th birthday date, with the proceeds also going to the UN's children's fund. UNICEF and the Smurfs joined forces two years ago to raise the plight of ex-child soldiers in Africa and are teaming up to promote children's rights and education worldwide. Check here their birthday party site that is available in 12 languages!